Gentlemen, we acknowledge the inappreciable services that France has received from the Irish Brigade, in the course of the last 100 years; services that we shall never forget, though under an impossibility on requiting them. 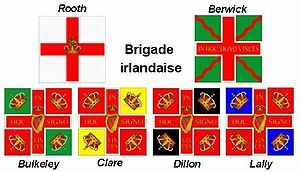 Receive this Standard as a pledge of our remembrance, a monument of our admiration, and our respect, and in future, generous Irishmen, this shall be the motto of your spotless flag: 1692–1792, Semper et ubique Fidelis. ^ Tozzi, Christopher J. Nationalizing France's Army. p. 71. ISBN 978-0-8139-3833-2. ^ D'Alton, John. Illustrations, historical and genealogical, of King James's Irish Army list 1689, Volume 2, London, MDCCLXL, pp.9–11. Also, Childs, John. The army, James II, and the Glorious Revolution, Manchester, 1980, ISBN 0-7190-0688-0, p.xiii. ^ Prebble, John. Culloden. p. 121. ISBN 0-1400-2576-6. ^ McGarry, Stephen. Irish Brigades Abroad, Dublin, 2013, p. 94. ^ O Ciardha, Eamonn, op cit., page 365. ^ Tozzi, Christopher J. Nationalizing France's Army. p. 23. ISBN 978-0-8139-3833-2. ^ Chartrand, Rene. Louis XV's Army (3) Foreign Infantry. p. 9. ISBN 1-85532-623-X. ^ Smith, Digby (2013). Armies of the Seven Years War. Stroud: The History Press. pp. 78–9. ISBN 9780752492148. ^ Mackinnon, Daniel.Origin and services of the Coldstream Guards, London 1883, Vol.1, p.145, "Irish (Foot) guards"
^ O'Callaghan, John Cornelius. History of the Irish Brigades in the Service of France, London, 1870, p. 358. ^ Eoghan Ó hAnnracháin, "Casualties in the Ranks of the Clare Regiment at Fontenoy", Journal of the Cork Historical and Archaeological Society, Number 99, 1994. ^ Moulliard, Lucien, The French Army of Louis XIV, Nafziger Collection, 2004, ISBN 1-58545-122-3, p. 64, translated by G.F. Nafziger from the original 1882 French publication. Childs, John. The army, James II, and the Glorious Revolution, Manchester, 1980, ISBN 0-7190-0688-0, pp. 1–2. Eoghan Ó hAnnracháin, Casualties in the Ranks of the Clare Regiment at Fontenoy, Journal of the Cork Historical and Archaeological Society, Number 99, 1994. Moulliard, Lucien, The French Army of Louis XIV, Nafziger Collection, 2004, ISBN 1-58545-122-3, p. 64, translated by G.F. Nafziger from the original 1882 French publication. Stephen McGarry's Irish Brigades Abroad (Dublin, 2013 Kindle edition, paperback May 2014) is a new book on the subject and finally updates John Cornelius O'Callaghan's History of the Irish Brigades in the Service of France (London, 1870). Mark McLaughlin's The Wild Geese, (London, 1980) was published by Osprey as part of their Men-at-Arms series provides an introduction to the subject. Uniforms and Regimental Regalia: The Vinkhuijzen Collection of Military Costume Illustration Sections on the French army from 1740–1789 show color plates of Irish regiments in French service.